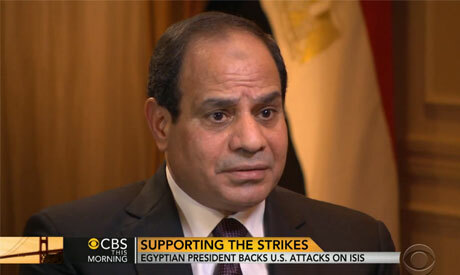 A screenshot from CBS This Morning YouTube video clip on 23 September 2014 showing El-Sisi's interview. President Abdel-Fattah El-Sisi has said he supports the fight against Islamic State (IS), and called on the US to send Egypt the military hardware it promised. The US and its Arab allies including Bahrain, Jordan, Saudi Arabia, Qatar and the United Arab Emirates said they struck Islamic State (IS) jihadists in Syria on Tuesday. Egypt and nine other Arab states agreed earlier in September to rally behind Washington in the fight against IS, as they seek to build an international coalition. El-Sisi, however, seemed reluctant to reveal details of Egypt's potential militant participation against IS, in a TV interview with Charlie Rose on CBS, published online on Tuesday. When faced with the question, El-Sisi first responded by asking whether the US needs the Egyptian air force in the attacks. The presdent then laughed, as Rose reiterated the question, and said, "Give us the Apaches and F-16s that you have been withholding for over a year and half now!" "We said it before and we reiterate the fact that Egypt is in a real and serious confrontation with terrorism," he said. "The idea is [that] the coalition is formed and we are part of this coalition and the symbolism is there with our public announcement that we are part of the coalition." Egypt receives $1.3 billion in military aid from the US annually. The United States originally announced in April that it had decided to lift its hold on the delivery of the attack helicopters to Egypt, imposed last year after the ouster of President Mohamed Morsi. On 21 September, US Defence Secretary Chuck Hagel confirmed to Egyptian Defence Minister Field Marshal General Sedki Sobhy the US plans to deliver 10 Apache helicopters to Egypt to support Cairo's counter-terrorism efforts. Sisi want iraq fire come to Egypt.because he want extand his by force govt.and want to make happy usa and isreal .